I have to declare shenanigans and false advertising on this one. 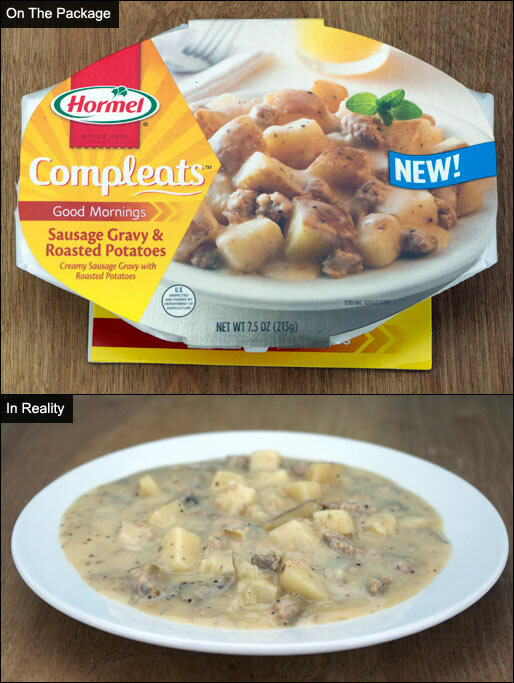 I hope Hormel pays their photographers and food stylists a lot of money. They pulled off a miracle by making these products look vaguely appetizing on the packaging. They actually turn out looking like slop. The good news is that they taste better than they look. This was the better of the two I tried. It's real appearance might be best described as runny with chunks. The potatoes will remind you of canned potatoes like those in Campbell's Chunky Soups. The gravy is actually flavorful and has a little heat to it. Unfortunately when you compare this to homemade or restaurant-served potatoes and gravy, this product tastes plain weird. That weirdness subsides a little as you eat more. Maybe you start to forget what the real stuff tastes like. Sadly though, the appearance and initial taste makes this a must-avoid product. Whereas the Sausage Gravy & Roasted Potatoes were weird, this product is SUPER weird - almost unbelievably so. The eggs - which taste nothing like eggs - have the structure of crumbled tofu. The potatoes and sausage which were barely acceptable in the other product are obscured by the mysterious, artificial flavor of the so-called eggs. The only reason I'm not giving these products the lowest score possible is because I like camping and hiking. If you need to carry hot meals that requires no refrigeration, consider fitting these in your backpack. That is the only situation in which these products are anywhere close to acceptable... in the wild when you're starving. A one-package serving of Sausage Gravy & Roasted Potatoes Compleats has 350 calories, 25 grams total fat (9 grams saturated and 0 grams trans), 55mg cholesterol, 670mg sodium, 21 grams total carbs, 0 grams dietary fiber, 3 grams sugar and 10 grams protein. A one-package serving of Sausage Breakfast Scramble Compleats has 350 calories, 26 grams total fat (10 grams saturated and 0 grams trans), 480mg cholesterol, 920mg sodium, 8 grams total carbs, 1 gram dietary fiber, 2 grams sugar and 17 grams protein. 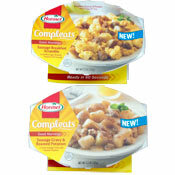 What do you think of Compleats Good Mornings Meals? Looks different in real life. Your description is perfect, and I've tried other brands that are "breakfast in a bowl", i.e., scrambled eggs, potatoes, and bacon and they are just plain horrible. It's a bad idea to try and mix everything in one bowl, but why do manufacturers try? Can't even cover up the awfulness by drowning it in ketchup. 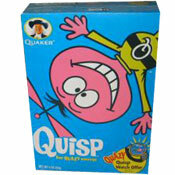 I just tried eating one of these and yuck! I am so sorry I wasted the money on this as it tastes almost like all the rest of their products, no matter what. 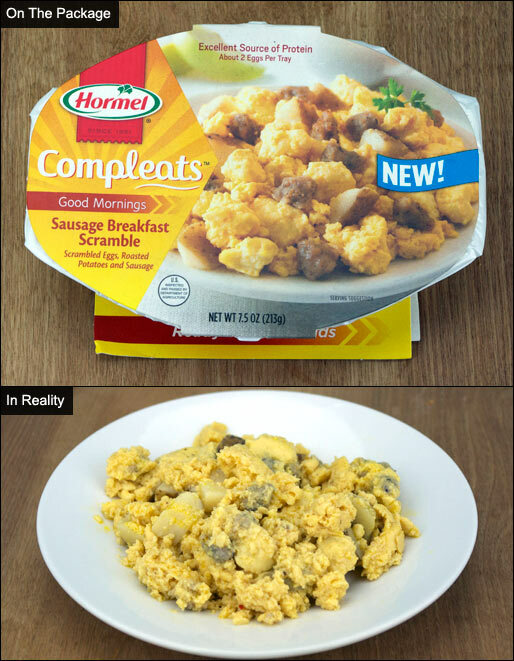 There is a central theme in the taste that runs throughout all of the Hormel meals whether breakfast or dinner or whatever. In this particular product that taste is an epic fail. The only word I can come up with is gross. I'm gonna stick with Jimmy Dean's breakfast from now on since they actually taste like the real thing and for the most part I think are the real thing. I am just not so sure about this stuff! I tried these too. Avoid any variety containing eggs. The sausage and potatoes are okay. They also sell oatmeal varieties which are pretty good.